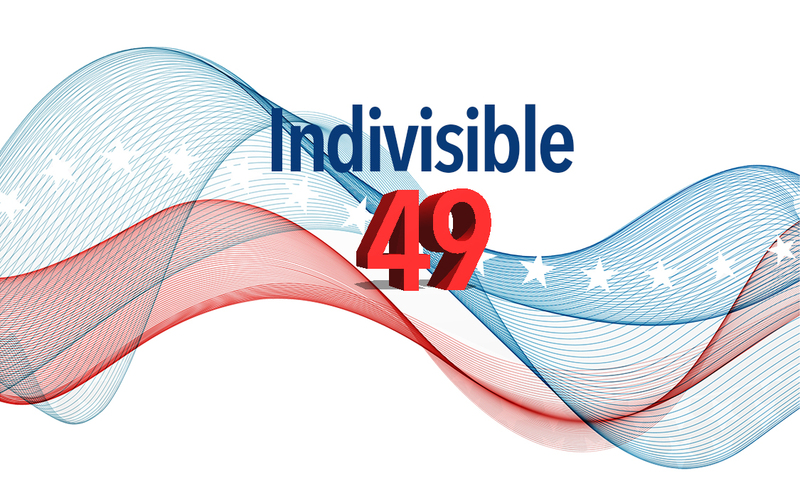 Get up to speed on what happened this week in our 49th Congressional District. Wow! What a week this has been! Thank you to everyone who organized, supported, and participated in our activities this week. We are evaluating several enhancements to our website that will enable us to communicate more fully in real time, and are always looking for ways to meet our goals of holding our elected representatives accountable to us. Your leadership committee is working hard to make our group a place where your activism can flourish and be meaningful. We've set up a forum on the website where you can exchange ideas - we are testing this out so give it a try and let us know if you have any suggestions. We held our second new members meeting at a private on Sunday evening. 50 new members shared why they came, learned about what we do, our committee structure and how they can help. We have decided to appoint a treasurer so that we can do some light fundraising to cover our costs for meeting rooms, web and email expenses, etc. And we added a technology committee. We are delighted to have so many committed people come our and join us on a Sunday night to see how they can help us, and how we can help them realize their activism. Many thanks to everyone who participated. The rally this week was full of surprises, the biggest being that Rep. Issa was there to speak with constituents. Another surprise was finding a crowd of Issa and Trump supporters waiting for us when we arrived. You can read the KPBS article about it here. 2,000 people showed up to speak with Issa - who did not sow up to listen to his constituents. The rally received wide media coverage both locally and nationally, including on CCN, the Washington Post and even a news crew from Dutch-TV! Read about it here and here. 200 constituents held a peaceful candlelight vigil to highlight concern about immigration reform and healthcare. News crews from the San Diego Union Tribune and television stations 5, 8, 10 and Univision were there. Here is one story. From a PR perspective, the Resistance - made up of a combination of activists groups locally - had a high profile week in the news. Local print, broadcast and online news outlets covered the weekly protest at Rep. Darrell Issa’s office on Tuesday, the Town Hall in Vista later that night, the candlelight vigil yesterday and Duncan Hunter’s efforts to silence constituents. The local resistance even captured air time on Rachel Maddow’s national broadcast. This is an unprecedented level of media coverage for an unmatched level of community activism. The theme this week is “A People’s Address”. In response to the President’s address to congress, we will be one of many rallies across the country to share our stories and our hopes for our community and our country. Details and sign ups here. Congressional Recess! Reps are in their home districts/states! Go get ‘em! At home this week for undisclosed activities. Kudos to everyone who made it out to the Tuesday Rally and/or Town Hall and/or Candlelight Vigil. S 389 The Kombucha Bill- Bill to make sure kombucha is exempt from liquor taxes. NEW BILL! HR 899 Disband the Department of Education by 2018 NEW BILL! Call or write postcards about HR 727, the defending of the Corporation for Public Broadcasting - it appears to be gaining traction. ***This is not a comprehensive list. We have focused on issues/people that most relate to civil rights, first amendment rights, health care, environment, women’s rights, and other causes.